Reading Buddies offers teens an opportunity to make a difference in their community as caring mentors to support and enhance younger children's reading skills. When: Feb. 29; March 7, 14, 21 and 28; April 4, 11 and 18. Little Buddies applications due Wednesday, Feb. 24, and Big Buddies applications are due Friday, Feb. 19. Where: Vail Public Library, 292 W. Meadow Drive, Vail. More information: Registration required. Applications for Big and Little buddies are available at the library, or call or email Cricket Pylman at 970-479-2179 or cpylman@vailgov.com to get your application. 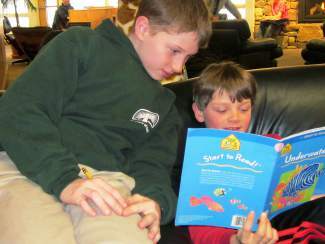 VAIL — The Vail Public Library’s Reading Buddies Program resumes Monday, Feb. 29. This program pairs trained teen volunteers (grades seven through 12) with younger children (grades one through three) in a shared reading experience. Reading Buddies will meet at the library once a week for the eight weeks between Eagle County Schools’ two winter holidays. Buddies will read, play games and do reading-related activities together. For the Little Buddies, the program offers a caring teen mentor to support and enhance their reading skills. Although Reading Buddies is not a tutoring service, it is a great opportunity for your child to have extra practice reading. Reading Buddies offers teens an opportunity to make a difference in their community. Teens who love reading, enjoy working with younger kids and are excited about giving back to their community by way of volunteering their time are welcome to apply. Little Buddies applications are due Wednesday, Feb. 24. Big Buddies candidates need to submit their applications by Friday, after which coordinator Cricket Pylman will contact them for an interview and training. This communitywide program is free and open to the public, and registration is required. For more information, call 970-479-2187.